Ask yourself one question...What would I do if I lost my data? Millions of people lose data every year due to fire, theft, natural disasters, human error and data corruption. It can cost the average person $450+ just to recover some of their data. Hard drive crashes are the #1 reason for data loss. Sometimes a hard drive may experience failure or sudden crash without any warning, but other times there are signs that something is amiss. Intermittent failures, changes in performance or sudden blue screens are telltale signs that the hard drive may be on its last legs. The most obvious sign that all is not well with a harddrive is unusual clicking, grinding or scraping noises. It’s not a question of if you will have a hard drive crash but when. 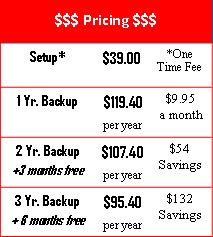 The only real way to protect your data from loss is to have a reliable backup system in place. The majority of people do not know how to backup and restore their data and sometimes they are reluctant to even do a backup because it can be time consuming. Some people backup to a CD or flash drive which can be lost or stolen and some people may backup to another hard drive which may fail before the other.Why risk losing years of your churches financial and membership information without a proper backup system. Offsite backups are the most inexpensive and most reliable backups then any other because data is kept in data centers through out the US which house thousands of secure servers that are monitored 24/7 and have fire suppression systems in place. So if you were ever to lose your data, it can be easily restored just the way it was before the incident occurred, With Data Bank you can have that piece of mind. Data Bank is a reliable online backup system that allows your data to be safely secured at an offsite location. Data Bank is fully automatic which means that there are no buttons to click, no CD’s to burn, no waiting for hard drives or flash drives. ChurchPro will setup the backup software for you to backup your ChurchPro data on a daily basis or on a certain day or days of the week. We set it and you forget it. If you ever need to restore your data a ChurchPro rep will even help restore your data. The backup software will even run missed schedules if it misses a backup and will even email us if there was an error during data transmission. For only pennies a day you can’t afford to not use Data Bank.